Makeup remover pads, gaviscon, crisps, egg fried rice x 2, chocolate, linguine, prawn crackers, Bombay potatoes, chicken, cereal bars, rolls, bread, white wine, eggs, yoghurts, cold meat, dog ham, orange juice, grated cheese, sausage rolls, chicken, cucumber, bananas, fruit, mushrooms, jackets, ice creams, garlic bread, chair, chocs for Ruth. Note how Rob gets four of his own yoghurts and Ruth is going to get some chocolates. 12 eggs is rather a lot and what is dog ham? 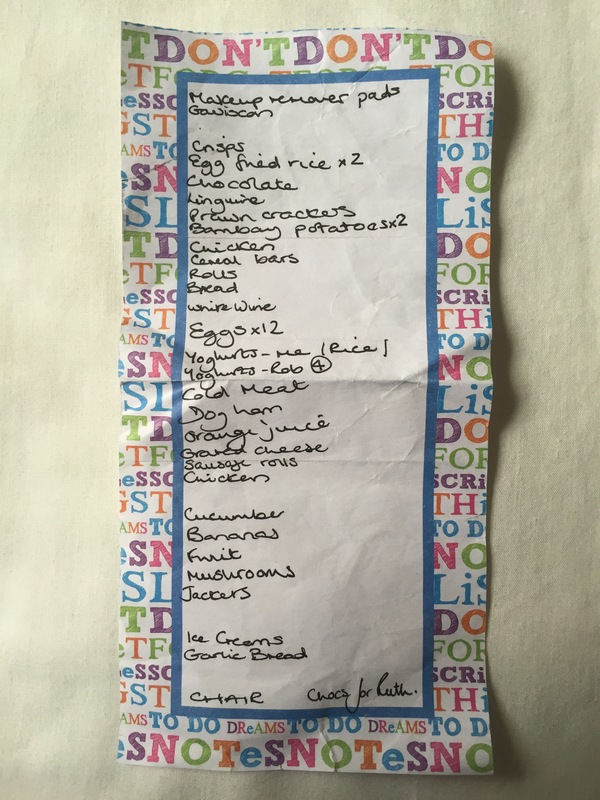 “Chair” is a rather unusual item for a shopping list, is it not? And “dog ham” could be ham for the dog? Who buys ham for a dog? Dog ham could be “hot dogs and hamburgers” – seems like a bit of a do and they need to pick up an extra chair.